Humfrey Nicasio, 24 years old from Tagbilaran, Bohol has a dream of becoming famous in showbiz. 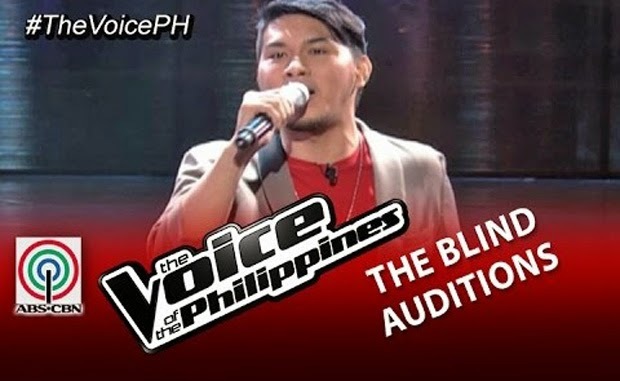 And this is the reason why he joined the Blind Auditions of The Voice of the Philippines Season 2. Before coming to the stage to perform, the hosts of the competition asked him, together with his mother, to do a sample acting and both of them did it. Humfrey is also a song composer. And one of his purposes in joining the competition is to let the world hear what he has written. Humfrey told a story about his inspiration – his girlfriend. When she was asked to describe her, Humfrey said that she was cute, “makulit,” chubby, and kind. The artist also said that the name of his girlfriend was Daffodil. During his performance, he was able to do his own version of “Happy” on which he believed could best reflect his personality. Humfrey tried his best to perform the song well in order to convince the coaches and he was able to do this to coaches Sarah and Lea but not to the gentlemen. According to Coach Sarah, the reason why she turned her chair is because of she personally liked his style and Coach Lea said that she liked how the artist gave a cheerful ambience by smiling a lot. The two coaches did their best to convince Humfrey and it was hard for him to decide. In the end, Humfrey explained that the reason why he picked a particular coach is because he believed she could be able to improve him more. And the coach he was referring to was Lea Salonga. Congratulations!